B e a u t i f u l. A u s t r a l i a n. No ifs, buts or maybes. 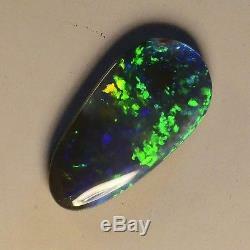 From our loose opal selection comes this gorgeous solid black opal. A wonderful solid black opal displaying beautiful 4.3 out of 5 bright twinkling and dancing greens, orange and blue coloring, all on an N2 dark background. 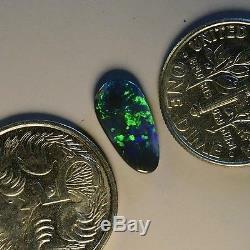 Measuring 12.10mm X 6.20mm X 2.10mm thick and weighing 1.02 carats, how wonderful this Lightning Ridge black opal would look in a hand made opal cocktail ring or perhaps a beautiful opal pendant with a diamond or two highlighting. 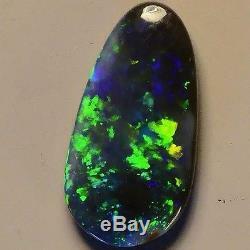 This is a totally natural genuine solid N2 very dark, 4.3 out of 5 bright black opal, it has not been dyed or treated in any way. The cutter of this wonderful gemstone has left some of the natural opal clay it was found in still in this back, proving beyond a doubt this is the real thing and hasn't been dyed or treated in any way. 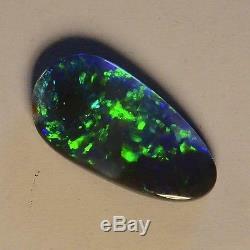 AWESOME NATURAL SOLID LIGHTNING RIDGE BLACK OPAL m12096 - YouTube. We can accept credit cards and electronic transfers through. Our reputation is paramount, without it we would not have been in business and the opal industry since 1967. We treat our customers with the respect we would like them to treat us with. 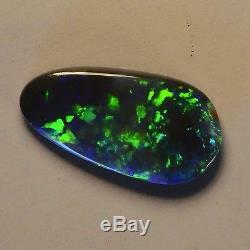 The item "BEAUTIFUL GREENS NATURAL AUSTRALIAN SOLID LIGHTNING RIDGE BLACK OPAL 12096" is in sale since Tuesday, July 5, 2016. This item is in the category "Jewelry & Watches\Loose Diamonds & Gemstones\Loose Gemstones\Opal\Other Opals".com" and is located in Nerang, QLD. This item can be shipped worldwide.